A Star-of-a-buck in Starbuck, Minnesota. Whether it’s “First blood gets the deer” or “The person who makes the killing shot?” In either case, it’s not an easy answer. My friend hunts private property near Starbuck, MN. He usually hunts a fence line dividing two fields. On this day, the neighbors were hunting close by, so he decided to hunt the adjacent woods. From his stand he heard a shot and watched as the neighbors drag a doe to their vehicle. While watching the hunters, a massive buck moving slowly, through tall switchgrass, caught his eye! The deer was between my friend and the other hunters. As the deer moved passed the other hunters, a safe shot presented itself. He took the shot and the deer dropped! You can imagine how excited he was! He yelled from his stand, “I have a big buck down!” The other hunters walk in his direction as my friend climbed down from his stand. 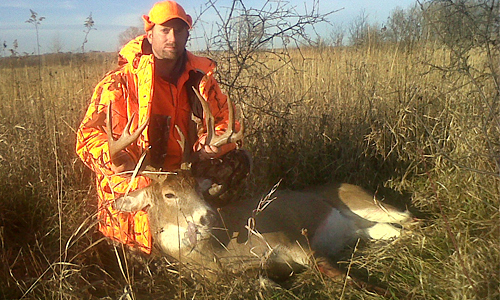 The hunters and my friend walked towards the deer from opposite sides — at 30-yards the deer gets up and starts to run. A hunter from the other party shoots and hits the spine — killing the deer. Later inspection, my friend had hit the deer in the hind quarter. It was a deer of a lifetime! A huge 11-point buck worthy of a wall mount! As everyone stood around the deer, the question came up, “So who’s deer is it anyways?” The hunter who shot the second time felt it was his deer. My friend feels that if he had not called the others over — that he would have had a second shot. In the end, my friend decided it wasn’t worth arguing over and walked away the better man. So what do you think? Please share your thoughts. Danger! Do Not Approach Humans! With the archery season in full swing and the firearms season not far behind, a great number of deer hunters will be taking to the trees in hopes of bagging that big buck! Deer hunting is an extremely exciting pursuit, and it is easy to get caught up in all that excitement, preparation, and pursuit. While we focus so intently on the different aspect of the hunt, one of the most important things we cannot afford to overlook is safety! An estimated 1 in 3 deer hunters will experience a fall. If you are one of those hunters who risk climbing a tree without a safety harness, perhaps you have already had a breathtaking experience? Thousands of hunters each year, all across the country, are involved in tree stand related injuries. These injuries can result in permanent paralysis and even death. One of the most important and wisest investments a deer hunter can make is in a TMA certified, full body safety harness. Safety harnesses and vests have come a long way and now offer hunter’s a wide range of comfortable, easy-to-use models. Research shows that the majority of accidents occur while climbing into or out of the stand. Many harness manufactures also make safety lines and devices geared toward preventing these types of falls as well. Safety harnesses are a great way for seasoned pros and youngsters alike to feel confident and safe! Remember – it’s important to follow all manufacturer guidelines with all tree stands and safety harnesses as well. So, in all the excitement that surrounds getting into the woods after that big buck, remember one of the most important aspects — getting home! So have fun, be safe and good huntin’!